This is Caroline. Beautiful smile, right? She's smiling because she's drinking clean water for the first time. She used to walk three hours every day to fetch dirty water. But not anymore. Her village just got a well. Clean water will change everything for Caroline and her community. For every Caroline, there are millions more children hoping to smile like that. 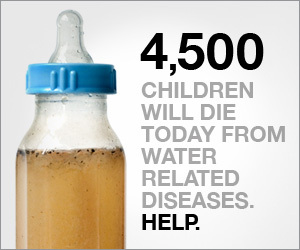 Almost a billion people on the planet don't have clean water right now. Who knows how many people you will impact. This is where it begins. Originally, the Kigarama villagers gathered groundwater contaminated by a nearby pond which caused everything from eye and skin disease to intestinal worms and diarrhea. Villagers were rendered unable to lead healthy, productive lives and when the well team arrived, their excitement was palpable. Tremendous amounts of manual labor cleared the path for the drill rig to tap into clean and safe water 20 meters below the surface, which now serves approximately 1000 Kigarama villagers. charity: water promo featuring "Time Bomb" by Beck from charity: water on Vimeo. When their water source was broken, women and children had to make multiple trips every day to collect dirty water, often missing work and school. Thanks to the International Rescue Committee, their water pump was fixed, and 300 people received hygiene and sanitation training. Some friends from the Tribe Syndication Association blogged about it too, here are some of their posts! Feeding our world takes up to 90% of our freshwater withdrawals but many people in developing nations still don't have access to enough water for irrigation. When a water project is built in a community, members can often use the new water source to grow small gardens near their homes and secure their own food supply. Self-sufficient households are less affected by external conflict, famine or inadequate government services. Blog Action Day this 2010 was about clean water? Well funded by Saks Fifth Avenue New York City. from charity: water on Vimeo. Through Living Water International (LWI) and its partner, ICDl, charity: water has already funded three new wells and 50 well rehabilitations, and plans to build another 15 wells in the region, and repair an additional 100 wells. These wells will provide clean and safe water to thousands of people. Tomie De Paola well in Daereka, Northern Ethiopia from charity: water on Vimeo.